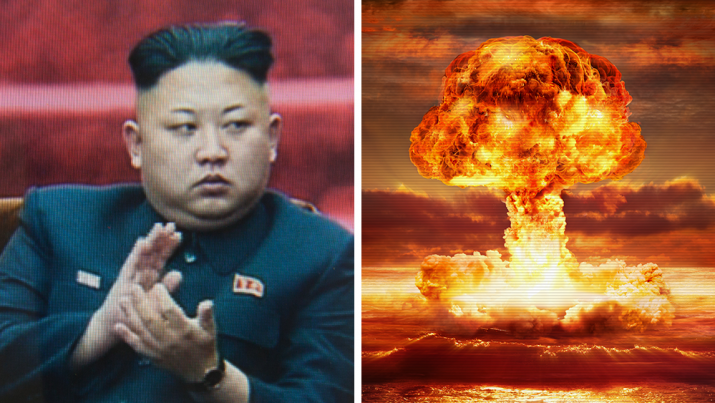 A high-level North Korean defector has just dropped a bombshell in an interview with Lester Holt of NBC News, explaining that his former country’s crazed dictator Kim Jong Un not only has highly capable nuclear weapons, but that he’s ready to use them to nuke America. As a political tyrant, Kim Jong Un mirrors many of the tactics of the corrupt political establishment in America, using his state-run media to brainwash his entire population into thinking that North Korea is under constant threat from the United States. Our own brainwashing media has similarly convinced all Leftists in America that our elections are run by the Russians, an idea just as foolish as the nonsense spewed by Kim Jong Un to keep his own population mind controlled and submissive. North Korea is well known to possess nuclear weapons and has accelerated its nuclear weapons testing since Kim Jong Un took power. Kim Jong Un can best be described as an extreme totalitarian crybully who claims to be the victim while threatening to nuke his political enemies. This mirrors the total insanity of the kind of Leftists that now dominate California politics, by the way, who similarly claim they have the right to murder conservative guest speakers to make sure they cannot utter words which might “harm” the fragile minds of California campus snowflakes. In the same way that Leftists have repeatedly threatened to assassinate Donald Trump because they don’t like his politics, Kim Jong Un says he’s going to launch nuclear weapons against the United States in order to eliminate his enemies. North Korea has at least two satellites that pass directly over North America… do they carry nuclear warheads for an EMP attack? Unbeknownst to most Americans, North Korea already possesses at least two satellites that orbit directly over North America. Conceivably, those satellites could already be carrying nuclear warheads and re-entry shielding, allowing North Korea to “drop” nukes into the atmosphere over North America. By detonating those nukes at altitude (perhaps 150 – 500 miles high), an EMP attack would be initiated that could take down the entire national power grid. The hearing, “Electromagnetic Pulse (EMP): Threat to Critical Infrastructure,” before the House Homeland Security Committee’s Subcommittee on Cybersecurity, Infrastructure Protection, and Security Technologies explored the effects that an EMP would have… Dr. Peter Pry, a member of the Congressional EMP Commission and executive director of the Task Force on National and Homeland Security, said during testimony that the issue is urgent because an EMP event could wipe out nine-tenths of the nation’s population. “Natural EMP from a geomagnetic super-storm, like the 1859 Carrington Event or 1921 Railroad Storm, and nuclear EMP attack from terrorists or rogue states, as practiced by North Korea during the nuclear crisis of 2013, are both existential threats that could kill 9 of 10 Americans through starvation, disease, and societal collapse,” he said. This means North Korea may already possess a weapon that could kill 90% of all Americans, and we have absolutely no defense against it. If you aren’t doubling down on your preparedness during all this, you’re oblivious to reality. This is the time to double check all your storable food, bugout plans and off-grid survival gear to make sure you’re ready to be the 1 in 10 who makes it through the post-EMP apocalypse, should one occur. It’s truly astonishing to realize that the fate of 90% of Americans may rest in the hands of an extreme left-wing totalitarian mad man who thinks he’s a god. In preparation for the rapidly growing risk of nuclear war or nuclear terrorism, we’re launching two new sites you’ll want to bookmark: Radiation.news and Nuclear.news. Watch for more content coverage at those websites soon. We’re also looking at ways to increase our laboratory acquisition of radiation detection technology so that we can bring you more details on radiation contamination of food, water, air and soil. Keep in mind I’ve also recently been awarded a U.S. patent on a breakthrough anti-radiation formula that eliminates Cesium-137 radionuclides from the body. I hope to bring you more news about radiation cleanup as events unfold.